We have some information you need to consider. A new type of investment is revolutionizing how small investors can play the markets. They trade just like stocks, but they're not options. And they are not the traditional shares you buy in individual companies. We're talking about exchange-traded funds, or ETFs. ETFs are game-changers — for two huge reasons. Ever noticed how it seems impossible to capitalize on breaking news about business developments on your own? Don't worry; you're not missing some special trick that other retail investors have found. Simply put, it's impossible. Large financial institutions have access to tools you cannot use. They are able to trade before markets open and almost instantaneously enter orders while you are stuck waiting for the opening bell. They will always beat you to the punch. Here is a perfect example: General Electric (NYSE: GE) announced it would purchase Lufkin Industries in a $3.3 billion deal before trading began on Monday, April 8, 2013. You'd be ahead of the curve if you were up early enough to catch the news... but there was no real way to capitalize on it. Everything was settled in pre-market trading, which small investors rarely can access. Even then, the price increase was over in a matter of minutes. Your brokerage, even if it allowed pre-market trading, probably would have never executed the trade in time. This happens with quarterly and annual earnings statements, along with any other news released while markets are closed. If a company beats or falls short of estimates, the stock value shifts before you can possibly buy or sell. You cannot race to capture profits. Day trading is virtually dead, at least for humans. Computers took over years ago. Building a passive portfolio with exhange-treded funds that track a sector or index will allow you to ignore these kinds of movements. ETFs allow you to use a single ticker symbol to gain exposure to a basket of companies. If you're currently investing in individual stocks to create a stable core portfolio, you get to skip all of the micromanagement and reduce trading fees to one single commission charge. According to Morningstar Inc., over the past 10 years only 38% of large-capitalization equity fund managers have beaten the S&P 500 return. That figure shrinks to 31% over the last five years, and 18% over the last three years. Even if you have an active fund manager who's on a hot streak and beat the market last year, you need to consider this: Only 9% of the managers beat the S&P 500 over all three time spans. It is exceedingly rare for any investor to find a consistent winner. As for the fees, U.S. equity ETFs have an average expense ratio of 0.4%, compared with an average expense ratio of 1.34% for actively managed mutual funds. Meanwhile, most large-capitalization ETFs charge .1% or less. Why give an actively managed mutual fund the money for lesser results and higher fees? Why not just buy something that mirrors the S&P 500 itself? This is exactly what ETFs will allow you to do for just about every index, sector and commodity. Before we get into some specific ETFs you can use to buy into the market as a whole, you should be aware there are going to be very similar, if not identical, ETFs to those we discuss below. Financial institutions have been listening to their clients, and they overwhelmingly want to boost ETF investments: More than 40% of investors plan to increase their use of passive ETFs, according to a recent Charles Schwab survey. Since 2003 investors have pulled $287 billion from actively managed equity funds, while investing just over $1 trillion in passive funds, such as ETFs. This is a big opportunity for large firms like Vanguard, Charles Schwab, etc. They're offering new ETFs as quickly as they can be approved by the exchanges. We'll focus on ETFs that are based on major indices here, but you should know you can easily find them for just about any investment. Bonds, real estate, commodities... you name it, an ETF probably tracks it. The Dow Jones Industrial Average is a price-weighted index of 30 "blue-chip" U.S. stocks. It is the oldest continuing U.S. market index. By far, the most popular choice to buy the Dow is the SPDR Dow Jones Industrial Average ETF (NYSEARCA: DIA). It is designed to mimic the weighting and performance of the Dow Jones Industrial Average index as closely as possible. While it's not exact, it does a good job of it and stays within a couple tenths of a percentage point of the Dow. The SPDR Dow Jones Industrial Average ETF was created in 1998 and has about $12 billion invested in it. This creates some great advantages. It has enough liquidity to easily enter and exit a position when you choose. If you invest in it, you're effectively paying a 0.19% fee that is incorporated directly into the performance of the ETF and collecting a 2.4% dividend. While the Dow Jones Industrial Average is probably the most recognizable index, the S&P 500, or Standard & Poor's 500, is a far broader index. It tracks the 500 leading companies publicly traded in the U.S. stock market instead of the 30 weighted options for the Dow Jones. As a result, it is considered a far better bellwether for the U.S. economy as a whole. The SPDR S&P 500 ETF Trust (NYSEARCA: SPY) – With an astounding $240 billion in total assets, SPY is by far the most popular option in the market. The expense ratio is 0.09% and it sports a 1.89% dividend yield. The iShares S&P 500 Index (ETF) (NYSEARCA: IVV) – While the iShares ETF is designed in a similar manner to the SPDR ETF, it is about half the size at $121 billion. You will save a bit of money by choosing this ETF because the expense ratio is 0.07%. The dividend yield is 1.85%. The Vanguard 500 Index Fund (NYSEARCA: VOO) – The final offering we'll mention is the smallest, by far. With $43 billion invested in it, the Vanguard S&P 500 ETF is a runt compared to the SPDR and iShares ETFs. It still has plenty of liquidity and volume to facilitate easy and quick trading without wide bid and ask prices. Vanguard clearly wants to take some of the market share from the other ETFs wit an expense ratio of just 0.05%. The yield is 2.08%. Picking the right one for you may come down to any reduction in fees from partnerships between the ETF issuer and your brokerage. All three ETFs trade very close to the S&P, rarely straying more than a couple tenths of a percentage point away from the underlying index. The dividend yields will shift around based on how the yields of the companies in the S&P 500 change as well. It gradually evolved into a true stock market by adding trade and volume reporting and automated trading system. 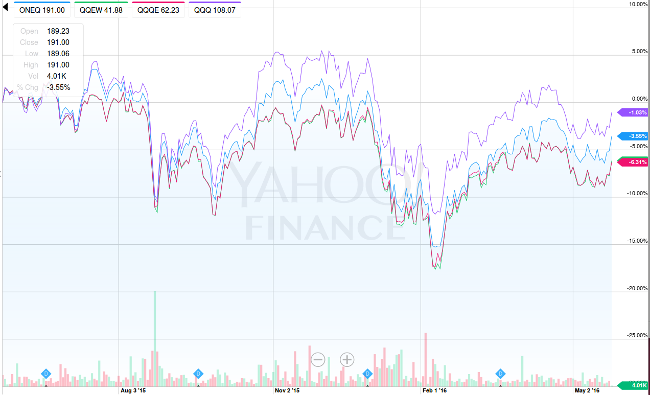 ETFs that are based on the NASDAQ are a bit more fragmented. They are offered for the NASDAQ composite index, NASDAQ 100 index, and specific sectors, such as biotechnology. For exposure to the full index, your best bet is the Fidelity NASDAQ Composite Index Tracking Stock ETF (NASDAQ: ONEQ), which invests at least 80% of assets in roughly 3,000 common stocks listed on the exchange. It has roughly $1.3 billion invested through it, an expense ratio of 0.3%, and a 1% yield. For a smaller sample of the NASDAQ exchange, you can use an ETF based on the NASDAQ 100 index: The PowerShares QQQ Trust, Series 1 ETF (NASDAQ: QQQ) is a great choice. It has $51 billion invested through it, an expense ratio of 0.2%, and a 1% yield. 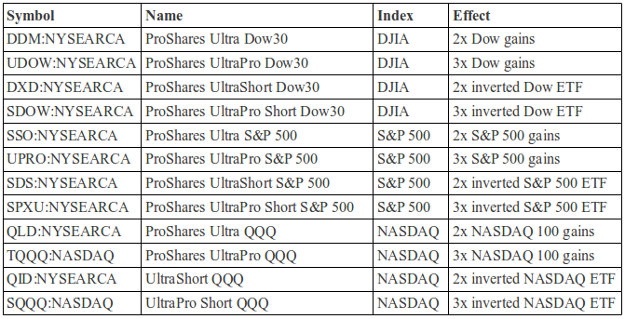 Equal-weighted NASDAQ 100 index ETFs are available as well. The best option here is the First Trust NASDAQ-100 Equal-Weighted ETF (NASDAQ: QQEW). You can save some money from fees by using the Direxion NASDAQ 100 Equal Weighted Index Shares ETF (NASDAQ: QQQE), but keep in mind it is much smaller. QQEW controls $372 million compared to QQQE at $61 million; QQEW will cost you 0.6% in fees, while QQQE will take in 0.35%. Both have yields around 1%. 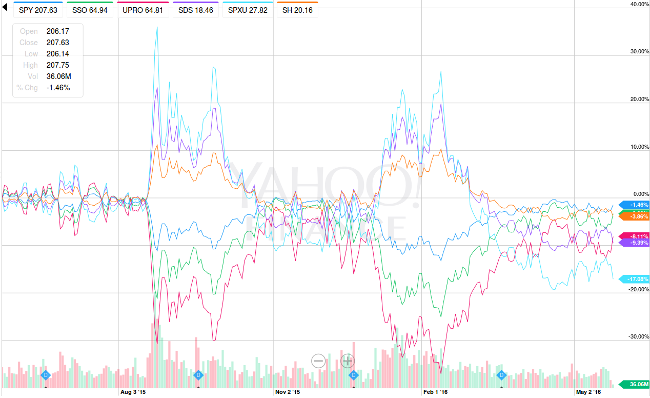 However, don't think that any of these ETFs are always superior. Sometimes it just works out that way. The main appeal of equal-weighting is to avoid situations where one company accounts for a huge chunk of an index. Your options for buying the market are not limited to U.S.-based exchanges and indices. It is easier than ever to purchase baskets of Canadian-based stocks through ETFs based on the Toronto Exchange, or TSX. The biggest and best is listed in the United States, which will make investing in it easier, and remove some tax complications. iShares MSCI Canada Index ETF (NYSEARCA: EWC), which controls $3 billion in total assets. The expense ratio is 0.52% and the yield is 2.44%. It is worth noting that EWC’s portfolio of just over 100 individual securities is primarily made up of the largest Canadian-listed stocks, including three financial behemoths: Royal Bank of Canada, Toronto Dominion Bank, and Bank of Nova Scotia. Combined, these three financial institutions account for over 17% of EWC's assets. There is a large exposure to energy sector stocks as well. So far we've gone over some of the largest and more popular ways to capitalize on rising stock market and index values. You can use ETFs to realize profits as the market falls as well. Unlike very risky and potentially catastrophic short positions, which require margins and can result in virtually unlimited losses, we'll look at some “inverse ETFs” that limit losses to what you invest and are easily traded. 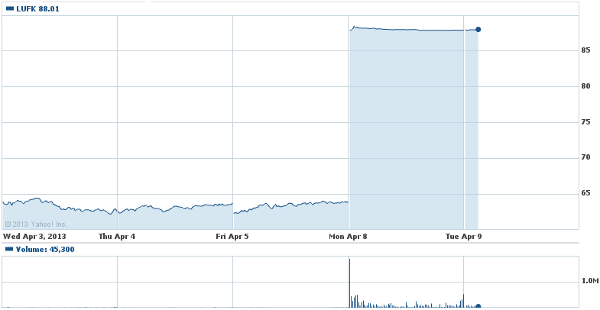 We're looking at the ProShares Short Dow30 ETF (NYSEARCA: DOG) in this chart. It sports $350 million in assets and a 0.95% expense ratio. For the S&P 500 index, you're best bet is the ProShares Short S&P500 ETF (NYSEARCA: SH), with $3 billion in assets. It has a 0.95% expense ratio as well. 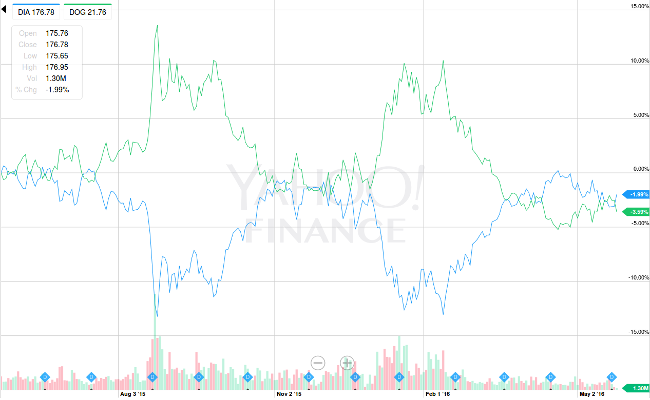 The ProShares Short QQQ ETF (NASDAQ: PSQ) will invert the NASDAQ 100 index. Once again, the expense ratio is 0.95% and the market cap is around $500 million. There aren't any real options for inverse ETFs based on the Toronto Exchange in the U.S. exchanges. If you have access to Canadian exchanges, you could use the Horizons BetaPro S&P/TSX 60 Inverse ETF (TSX: HIX) with $22.5 million in assets. The 1.15% fee will definitely eat into profits. If you're investing from the United States, you'll also have to consider the headache from complex international investment tax issues. Remember how financial institutions are falling over themselves to offer new ETFs into the market? Well, they have some higher risk/higher reward options for you, too — you can double or triple the effect of just about any U.S.-based index using ETFs. ProShares created a number of these earlier and captured a lot of the demand for these ETFs. We recommend investors focus on their products. All of these have the same 0.95% expense ratio built into their performance. The amount of assets controlled by these ETFs varies quite a bit. As you might imagine, the size of these ETFs generally match the risk. Investors tend to avoid the riskiest 3x ETFs more than the 2x ETFs, which are smaller than the "standard" ETFs. Volume is much lower for the 3x ETFs as well. The higher the level of leverage, the more erratic the price movement becomes and the less precisely these ETFs double or triple the underlying index they track. For using a diversified base index to buy and sell the market, the ETFs we've covered so far are unparalleled. There are standard, inverted, doubled and tripled ETFs for individual sectors, commodities, more obscure indices, the S&P 500 Volatility Index (VIX), and just about anything else you can imagine. Hopefully, you'll think twice about putting your money into individual stocks, actively managed funds, or any mutual funds while setting up a diverse portfolio. After all, you can avoid the need to micromanage positions, pull in superior profits, and save a ton of cash. Lower fees and commissions will allow you to put more into the market and add up to a whole lot of extra gains in the long term. Thanks for subscribing to the Outsider Club. We'll continue to find ways to boost your portfolio with flexible and safe investments that will help you break free of the traditional trading advantages, traps, and pitfalls financial institutions use to siphon off your wealth.